Franky: [Franky walks out of his house mumbling to himself] I'm gonna have some soup. I'm gonna go eat dinner. Come on, I just wanna eat dinner. Beautiful to look at. Thats about it. Warner Brothers is one of the best movie studios in the business. Putting out controversial movies such as, A Clockwork Orange, Natural Born Killers & One Eight Seven, it's clear that this is a studio that likes to takes risks with films. 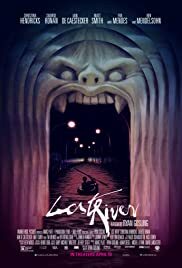 They prove it yet again with the directorial debut of Hollywood heartthrob, Ryan Gosling's art house flick, Lost River. I'll start by saying this about the film; it is absolutely gorgeous to look at. Gosling has an eye for camera placement and style, taking a page out of the David Lynch School of directing. Unfortunately that's where the praise stops, as this is one boring and rather pointless movie. The story centers on a single mom played by Christina Hendricks, (Mad Men) who lives in a virtually abandoned city of Lost River, with her two kids, one of which has run afoul of the local gangster played by Matt Smith. (Dr. Who) A Gangster so mean that it's widely know throughout the community his love for cutting off peoples lips who cross him. In the end it's clear that Gosling wants to shed his pretty boy persona and come across as more intellectual and thoughtful. Hopefully the next time he decides to get behind the camera he has a better script to film.